It is a memoir about my husband Michael Donaghy, his death at the age of fifty from a brain haemorrhage, and my subsequent journey of grieving. “The Great Below” is written with great restraint, delicacy and wit, and every page shows the author’s talent for original phrasemaking; she also seems to have something of the poet’s gift for the ‘the singing line’. The book is a moving, compelling and cleverly constructed memoir of grief, head-and-shoulders above a number of books I have read in a similar vein; it strikes me as the work of a considerable new talent.” Don Paterson, poet. Tell us about the title. After Michael’s death, I started writing a diary of sorts, knowing that if I could get some of my experiences and feelings down in words, I might at some point be able to make sense of what I was going through. At the time it was totally bewildering, and my initial title for the diary was “Unacceptable feelings”; I didn’t seem to be feeling either what I or anyone else expected, or not at the right times. For example, I did not feel particularly sad at the funeral, although I have cried plenty since. Also it seemed that the experience of grief is very solitary – that as a society we have somehow forgotten how to grieve or how to support others who are grieving, so that I couldn’t find a mirror of my experience out there in the world to reflect what was happening to me. A couple of years later, we were on holiday in Cornwall and I suddenly decided that I would try and turn my miscellaneous collection of outpourings into a book. Partly, I wanted my son to have a coherent record of what had happened around his dad’s death, as he was only eight at the time. Also, I thought that perhaps I could, in writing, create that mirror of grief for others to look into and see something of their own experience. It took me several years to finish the book, during which many other things happened to distract me from the writing, but which also contributed to the end product. I got very ill, with a kind of M.E. that laid me low for long stretches of time. However, this proved to be fertile time for writing as every day, after putting my son on the bus to school, I spent the morning in bed with my laptop. The illness also became a major part of the narrative, as it was clearly in part a reaction to the shock of bereavement. Then my mother needed to be moved into a nursing home because she had developed Alzheimer’s disease; we had to clear out her house and put it on the market to pay the fees. At the same time, my son was being thrown out of the Steiner school he had attended since kindergarten – he had got into a spiral of bad behaviour, which they simply did not know how to handle. It was a very painful, confusing time and although much of this initially found its way into the book, I later decided to cut it out again in order to concentrate on the main narrative. What period of time does the book cover? I thought it important to show that grief is not over and done with in a few weeks or months. I’ve read several books about the first year of bereavement, but in some ways I feel the real work does not start until after that period of total shock and confusion. I even wonder if, in a strange way, writing can be a way of postponing the inevitable facing up to your feelings. Bereavement is a long, long process – in fact I think it lasts a lifetime, which doesn’t mean the intensity of the grief remains the same, just that it becomes part of who you are now. You are forever changed. The story in the book extends over quite a few years, but I have somewhat compressed the timeline because it began to seem like an endless log of events and trips: a “wandering in pathless pathways ” (the OED definition of ‘bewildered’). I needed it to have a conclusion of sorts, an ending that allowed for hope rather than despair – both for myself and the putative reader. But I hadn’t quite lived that part of the story yet. In my mind I held onto “The Descent of Innanna” as an overall shape, because I knew that eventually she returns healed from the underworld, and even while I was still trudging through the darkness, I hoped that I would one day see light in the distance. Did you show it to anyone? When I had finished a first draft I sent it to a friend who teaches life writing at university, who was also a great friend of Michael’s. I knew that she would be honest, but also kind, in telling me what it needed. She explained that I needed to think of how to turn it into an ‘artefact’ – a piece of work that had it’s own inner logic and shape. That’s quite hard when you are still, as it were, living the narrative. But I knew what she meant: I sometimes compose music and I learned early on that it’s not the individual tunes or bars that make a piece work, but the overall structure. How do you feel now that it’s being published? Great pleasure mixed with some trepidation: I am quite an introverted person, like many people who write, and the material is of course very personal. But as a friend said to me – ‘You can’t write a memoir and then not want to talk about yourself!’ Enough time has elapsed since Michael’s death that the subject no longer feels so raw and vulnerable. And maybe it’s time to tell everyone a little bit more about him – he was also a very private person, so I haven’t completely “spilled the beans”, but I am undoubtedly the person who knew him best in the world. My biggest hope for this book is that it will reach out to others going through bereavement, loss and trauma, and offer them a path of hope and healing. After all, it’s something we will most likely all have to face at some point. It’s a book about sadness, but I don’t think ultimately it’s a sad book – a book about strength and resilience, but also about staying true to your feelings and finding a way to live with them. 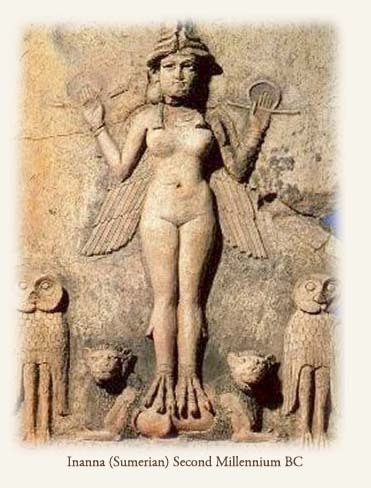 Inanna, the goddess of life and the heavens in Sumerian mythology, descends to the underworld to appease her sister, the furious queen Ereshkigal who is mourning her dead husband. On the way she must pass through seven rocky gates; at each of these she is stripped of one of her royal garments or attributes, until finally she is killed and hung naked on a hook like raw meat. Up above, her handmaiden Ninshubur goes to the father gods to ask for help, as she has promised to do should Inanna not return within three days. At first no-one will comes to her aid, until Enki, the god of wisdom and the waters, fashions two creatures from the dirt beneath his fingernails who he sends to rescue Inanna. These creatures are able to slip through the earth into the underworld, where they meet and sympathise with the unhappy Ereshkigal. They bear witness to her pain and grief, and in her gratitude for being heard she softens and allows Inanna to be freed and restored to life. Innanna is pursued out of the underworld by evil spirits who want to find someone to replace her – they seize upon on her husband, the shepherd Dumuzi, who has been enjoying his life on the throne without appearing to mourn his missing wife. But Dumuzi’s sister, out of love for him, offers to spend half the year in the underworld in his place. Thus are scores settled and the spirits of the underworld appeased. Tags: bereavement, death, Great Below, grief, grieving, healing, Inanna, loss, Maddy Paxman, Michael Donaghy, poet, recovery, widow, widowhood | Permalink.